data for a Doom game.. Extract the PrBoom package in your game folder. You can extract the file in the PrBoom directory with unarc. Start the game by double clic on "Start-PrBoomGL-os4" icon. the vertical mouse sensivity to the minimum in the options. "Start-PrBoomGL-os4" or directly the .cfg file. predator.wad and begin at the level 4 of the episode 3. Note that you can also tell the game where he has to store your save files. skill) or double clic on its icon. 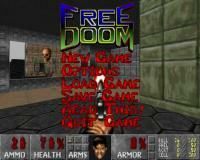 Contributors to the Freedoom project. All rights reserved.